Calvin Bruneau was blowing minds by telling facts rather than fiction. It was 2012 and Bruneau, who heads a First Nations group that isn’t fully recognized by Canada, was narrating the history of Edmonton. But as he lectured to the first-year native studies class at the University of Alberta, he included the Papaschase people in the story. 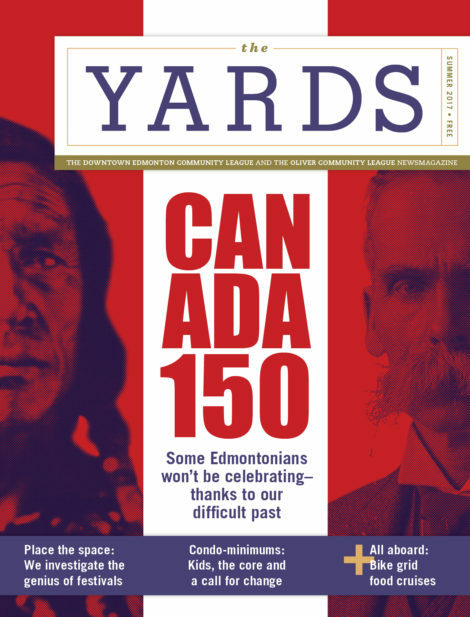 Edmonton’s standard foundation myth is full of yarns about forts and voyageurs, pioneers and oil derricks, business people and settlers. Historically, the sometimes beautiful, sometimes stark stories of indigenous peoples and their lands have been left out of Edmonton’s story. But Bruneau didn’t omit them as he talked that day and sure enough, mouths dropped. Canada is 150 years old on July 1. Ottawa is bankrolling a birthday party set to sweep through our city and many others. But the indigenous nations that Canada swallowed to become a country are many thousands of years old. And the story of their lands, which many settlers took, and their cultures, which colonialism attacked, are plot points that Canada has struggled to place in its happy-birthday narrative. Knowingly or not, Edmonton residents, including those who live downtown or in Oliver are connected to this darker, often hidden story. Indeed, some of the same people Edmonton has lionized as founders are those who indigenous peoples, like the descendants of the Papaschase, see as the central characters responsible for taking what was theirs. So, as we prepare to mark Canada’s 150th birthday in our city, some say it’s time for some harder work—to advance the conversation and make these two histories one. Houle is a member of the Swan River First Nation and has written several indictments of Edmonton’s history from an indigenous perspective. A central reason for why he says he struggles with Edmonton celebrating Canada 150 largely goes back to one man: Frank Oliver. Oliver is something of Edmonton royalty. To this day he’s celebrated in city discussion as a pioneer, a business man and Alberta’s first member of parliament. Fittingly, Oliver’s name is everywhere. In the 1950s, the city named the neighbourhood he built his house within after him. There’s also Oliver School, a park and a community rink, as well as a power centre. Oliver is given a prominent story at Fort Edmonton Park, too, celebrated for his use of his printing press to publish the city’s first newspaper, The Bulletin. But Oliver’s role in Edmonton’s history is far different when you ponder his dealings with indigenous people. History shows he used The Bulletin and his powerful positions in governments to systematically attack many indigenous nations and ultimately take their land, upon which much of our city was built. It’s a point Houle can’t omit. “He may have done some things, he may have helped the city of Edmonton become what it is today, but people have to realize that the reality and the truth is a lot of that success came at the cost of someone else, and a lot of those people were indigenous people,” he says. Consider the Papaschase. In 1877, as Chief Papaschase—known to newcomers in Edmonton as John Gladieu-Quinn—signed Treaty 6 at a spot roughly where the Alberta Legislature now resides, the Papaschase saw the Canadian government attempt to reduce their vast, traditional territory to a land reserve of just 100 square kilometres in size. Papaschase selected the land he wanted, as was his right, choosing a square of land about 10 kilometres south of the North Saskatchewan river. But the land was ideal for farming and Oliver knew it. In editorial after editorial, he targeted the Papaschase reserve. He lobbied Ottawa for “settlers rights” and dismissed the Papaschase people as “lazy,” or, incredibly, as not “true Indians.” Meanwhile, the Papaschase version of history recalls how rations promised by the Canadian government never arrived and that the disappearance of the buffalo, which coincided with European settlement of the North American prairies, saw them slowly starving to death in their reserve. In 1888, 11 years after signing Treaty 6, Oliver succeeded—at least in the eyes of Canada. Three men, who were then living on the Enoch reserve to survive, signed what Canada took (and remains to this day to support) as a land surrender to the Papaschase reserve. Three signatures and it was gone. Today, the former Papaschase reserve is parts of Old Strathcona, Ritchie, Queen Alexandra, Hazeldean, Pleasantview and Mill Woods, to name a few neighbourhoods. Papaschase has been all but erased—aside from one industrial neighbourhood, just north of the Whitemud and east of Gateway Boulevard, which bears the former chief’s name. In 2008, the Supreme Court of Canada rejected a Papaschase application to pursue a land claim and calls for about $2.5-billion in compensation. Houle says he will never forget Oliver’s connection to this history. “I purposely avoid Oliver [neighbourhood] because it has a reminder for me, as an indigenous person—one I’m sure people from Enoch and people from Papaschase has an even stronger recognition of—of what this guy did to them,” he says. Cory Sousa first learned of the hurt surrounding Frank Oliver’s name when he was involved in discussions to move the privately-owned downtown park that was named after Oliver. That park is currently in a sort of limbo, as its former home—right beside Hotel Macdonald—is being developed. But when some proposed moving it into the Oliver neighbourhood, the community spoke. Sousa is a principal planner with the City of Edmonton’s naming committee and has been pushing— along with strong public support from people like Mayor Don Iveson— for dramatic change in what receives name recognition. Most recently he’s advocated assigning indigenous names within Edmonton’s river valley trails in the future. He says he feels names can be tools for creating the conversation many say Edmonton needs to have during Canada 150. And, he says, there are signs of progress. Consider Alex Decoteau Park, opening in September along 105 Street at 102 Avenue. Originally the park was set to be called “Renaissance Park,” but Sousa and others worked behind the scenes to see it honour Decoteau, who among other things was an Edmonton police officer, a soldier in the First World War and a marathoner. But Sousa knows there are other names that might be hard to change. Oliver is one of them, he says. Instead, he sees more possibility with new names, or in shifting existing ones, to spark conversation and learning. Bruneau heads the Papaschase, though there are other groups that claim to represent the descendants of former Chief Papaschase as well. Regardless, he says his battle is to see the Papaschase become part of Edmonton’s mainstream story. We meet the day he’s finished work consulting with the city on artwork depicting Chief Papaschase, to be installed at a stop in Mill Woods along the future Valley Line LRT. But that’s just the beginning, he says. In future, Bruneau says he’s hoping to create an urban reserve where land, profits and taxation powers are returned to the Papaschase. And as Canada 150 approaches, he’s hoping his nation’s story will prompt many in Edmonton to ask why they know so little about his history. Tim Querengesser is president of The Edmonton Wayfinding Society. He's written for Atlantic Cities, Alberta Views and Avenue. This entry was posted in 2017 Summer, Feature, Issues.